Quench your thirst with our selection of cold, refreshing fountain drinks. We never ask you to settle, because we offer both Coke and Pepsi! Take your favorite with you in our specially designed cups that keep your beverage cold, but never sweat. Available at many of our locations. Check your local FiveStar to see what we have to offer. Our Flavor Fusion allows you to make your favorite fountain drink just that much better. Choose to add flavor shots like Energy, Cherry, Vanilla or Lime to create your own unique experience. We have your ice tea needs covered with our delicious sweet or unsweetened options. You’ll love the refreshing flavor of our tea that is always guaranteed to be fresh. 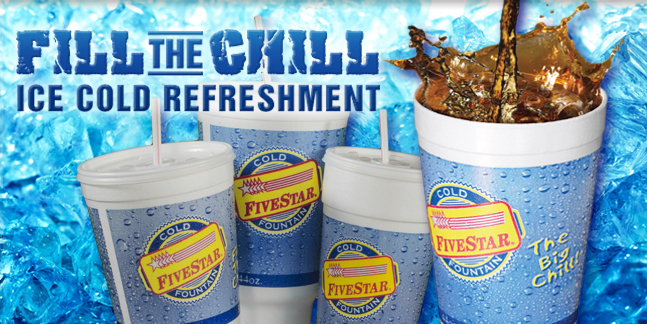 Get chillingly refreshed with a FiveStar Freeze. Choose from flavors like cherry and blue raspberry for your frozen treat.